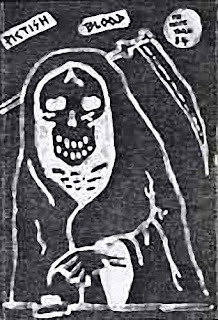 An old cassette release from 1983, Brisbane band Pictish Blood's The Indestructible Smile. I sold this cassette years ago but recorded it before I got rid of it. I will get it back up in the next day or so for you. Thanx for the upload. I'm the singer for the band and never made the effort to digitise the tape. Interesting to hear it again. The track listing is slightly out and I thought you might like to know what it should be. "Sick Imaginations" is "Sick Imaginations" and "Global Conflict". It's two songs that are merged because the sample overlaps them. Ideally the track should be split in two but we made that difficult. Just wondering if the noise on the B side is 'sposed to be there or not? Is there anywhere specific the noise is? The extra sound in Violent System is an angle grinder, which looks better than it sounded. That'd be it, I can see it now. Love your work. I've posted some links the page, so hopefully you will receive some traffic.